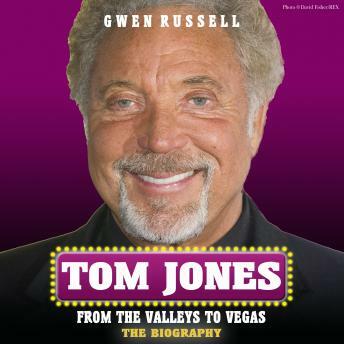 Celebrity biographer Gwen Russell traces Tom's phenomenal journey from his first South Wales gigs as an unsigned frontman, to his breakthrough hit 'It's Not Unusual' and beyond to his superstardom as the voice behind 'What's Up Pussycat', 'Delilah' and 'She's a Lady'. But it has not all been plain sailing for the legendary Grammy- and Brit Award-winning entertainer whose shows are renowned for knicker-hurling frenzies. Tom was struck down by tuberculosis and bed-ridden for almost a year; he has had affairs; lost his long-time manager to cancer; and ridden the quiet times in his career to come out on top. His collaborations reads like a who's who of pop and rock histoy and includes Johnny Cash, The Bee Gees, Robbie Wlliams, Pavarotti, Jools Holland and The Cardigans - not forgettong, of course, his recent Comic Relief rendition of 'Islands in the Stream,' with Gavin and Stacey characters Bryn and Nessa. This informative amd affectionate account includes recollections from famous friends, relatives and contemporaries. It paints a complete portrait of one of Britain's most talented men; a true national treasure.